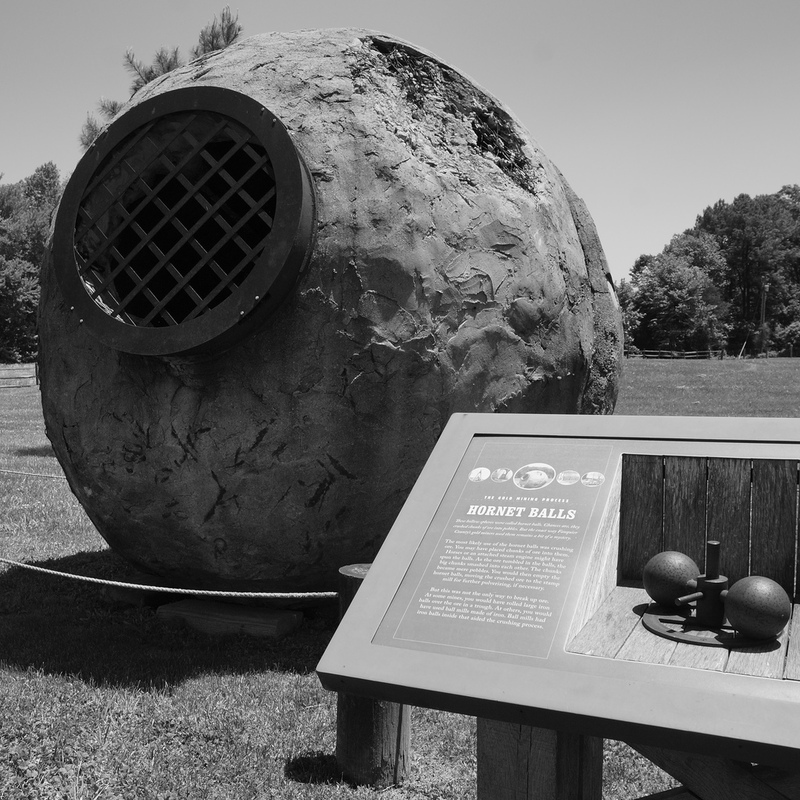 Hornet balls in Goldvein, Virginia; used to crush ore for gold mining in the late 1800's and early 1900's. Photo by Stephen Little/Flickr (Noncommercial Use Permitted with Attribution). The park features a gold mining camp area, museum, living history programs, gold panning demonstrations, and interpretive programs. The Virginia gold belt encompasses an area of about 4000 square miles (from Maryland running Southwest to the North Carolina state line); 200 miles in length and varying from 15 to 25 miles wide. The Virginia gold belt passes through Fauquier County at the Morrisville/Goldvein area, where approximately 18 gold mines once existed. Native Americans and early European settlers discovered small quantities of the precious metal, but the Goldvein area did not attract serious attention until the early 1830's, when prospectors panned for gold in the Rappahannock and Rapidan Rivers. Eventually the search for hidden veins of gold led miners to dig trenches (placer pits), and in the early 1900's, excavate deep shafts.